Sterling Silver Blue Topaz Round Oxidized Rope Split Shank Ring This beautiful ring showcases a round blue topaz gemstone set with a vintage-inspired split shank oxidized rope detail. 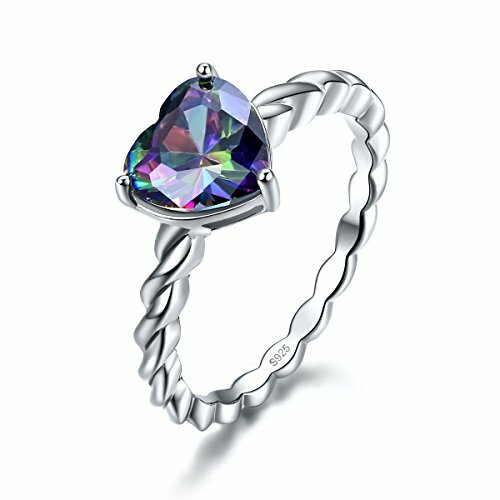 This bohemian ring is crafted of sterling silver and is nickel free. Offered in the following sizes: 5, 6, 7, 8, 9, 10 Get to Know Ice Gems: Ice Gems flaunts a dazzling splash of color and glamour. Our awesome line of genuine, created and simulated gemstone jewelry allows your inner strengths stand out! We carry a full variety of jewelry which includes: Birthstone, halo design, adjustable bracelets, lever-back earrings, stud earrings, solitaire jewelry, heart jewelry, infinity jewelry, gemstone fashion rings, gemstone tennis bracelets, religious jewelry and more. Great gifts for your girlfriend, fiancee, wife, mother, daughter, valentine’s day, christmas, hanukah, mother's day, birthday, anniversary, graduation. Gratitude: If there is any issues please contact us directly. Your feedback and suggestions will help us make better products and provide better service. Your feedback is our motivations to improve. We are looking forward to your 5 stars feedback. 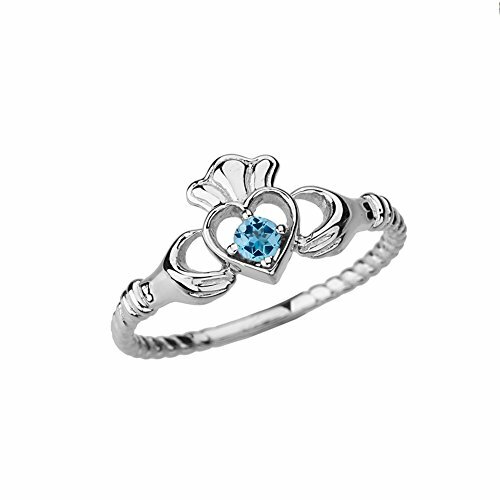 This 10k white gold claddagh ring features an open heart rope design with a round genuine Blue Topaz gemstone and can be worn as friendship rings, and are also used as engagement and wedding rings.If on the right hand with the point of the heart toward the wrist, they are in a relationship, meaning their heart has been taken. On the left hand with the point of the heart toward the fingertips, the wearer is engaged.On the left hand with the point of the heart toward the wrist, your too late, the wearer is married.Worn on the right hand with the point of the heart toward the fingertips, the wearer is single and may be looking for love.This is the case when a young woman has first received the ring from a relative, unless she is already engaged.Individually hand polished to a lasting high sheen polish finish.This ring is both of unsurpassed quality and impressive design. 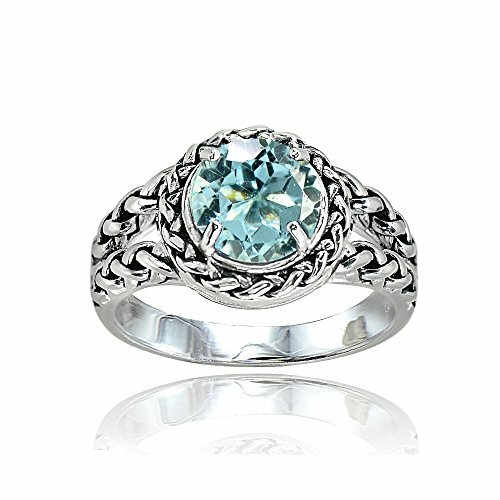 This Blue Topaz rope design ring was individually hand polished to a lasting high sheen polish finish.Made in the USA, this dainty ring is both of unsurpassed quality and impressive design. 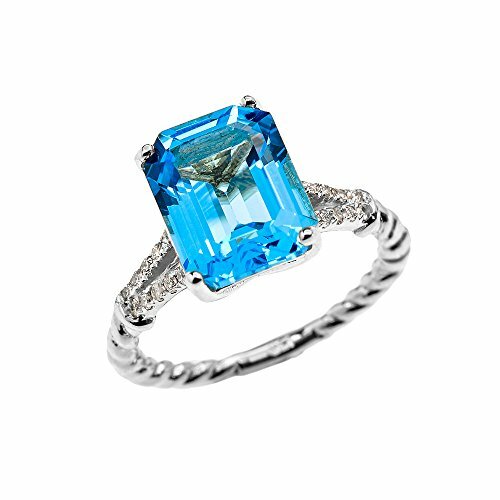 This rope design solitaire emerald cut Blue Topaz and diamond ring was individually hand polished to a lasting high sheen polish finish.Made in the USA, this ring is both of unsurpassed quality and impressive design. A Timeless Treasure and Style Classic, our rings are always fit for any occasion. 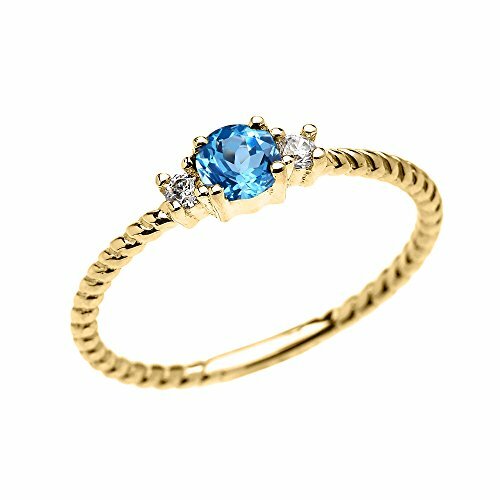 Beautifully crafted and designed our Swarovski Topaz ring is sure to win your way into her heart. This ring crafted in 925 Sterling Silver that adds a polished look to any ensemble and outfit. This ring is the perfect ring for engagements, weddings and all other occasions. As always with all of our products this item comes in packaging making it ready for gifting as soon as it is received.This beautiful item is brand new and comes with complimentary gift packaging appropriately selected to match the item you purchased. The packaging ranges from dainty foam insert packaging to luxurious leather insert cherry wood boxes. Every order is fully insured regardless of value. This insurance protects you against damage or the loss of your item while in transit. The Shipping and Handling fees include the insurance so there is no need to pay separately for insurance. 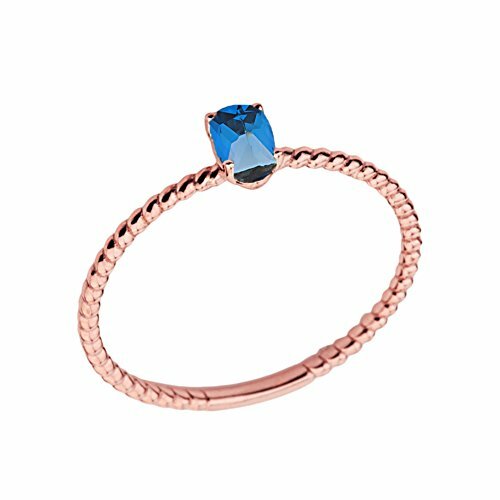 Looking for more Blue Topaz Rope Ring similar ideas? Try to explore these searches: Diamond Teardrop Pendant Necklace, Ncaa Kids Jackets, and Twin Size Walnut Headboard. 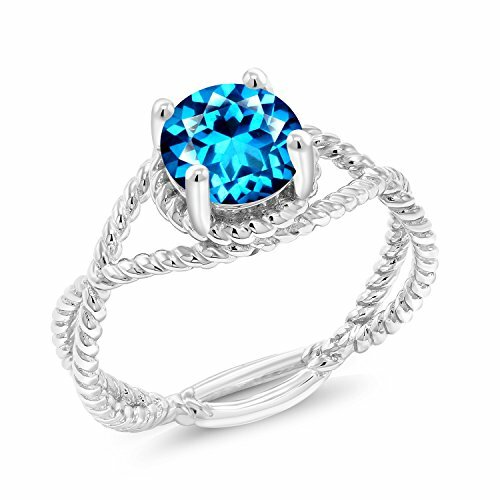 Look at latest related video about Blue Topaz Rope Ring. Shopwizion.com is the smartest way for online shopping: compare prices of leading online shops for best deals around the web. 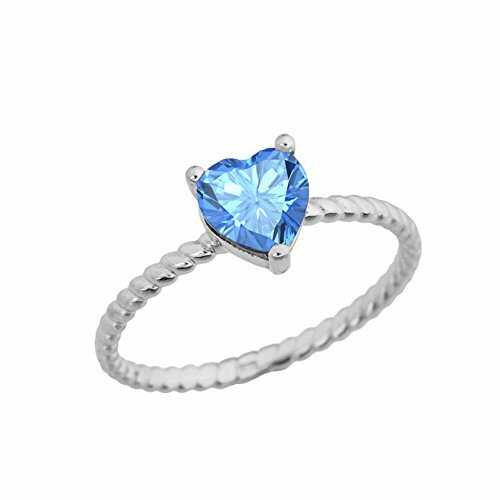 Don't miss TOP Blue Topaz Rope Ring deals, updated daily.